The pill tray has 28 compartments that can be filled with medication. Each compartment is 1" x .5' x .75" and can hold pills of different sizes and combinations of sizes. When the alarm sounds, the tray advances allowing you access to the medication in that compartment. If you use one daily alarm, the tray is good for 28 days of medication dispensing. 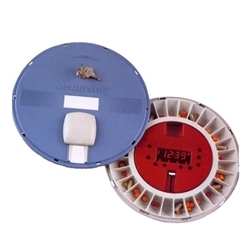 When the alarm sounds, the tray advances allowing you access to the medication in that compartment by sliding open the white window and taking out the medication with the fingers. Two alarms daily = two weeks worth of medication. Three alarms daily = 9 days of medications. Four alarms daily = one week's worth of medication. If you miss a medication time, the tray will advance at the next scheduled alarm. This will prevent double dosing and medication errors. Features an AC power backup and comes with rechargeable batteries that will last up to 72 hours. A locking cover provides a tamper proof secure dispenser. Costs less than other carousel dispensers and has many of the same features. Basic Medready with 28 Dose Capacity and up to 4x per day dosing. Audible alarm that responds at 400Mhz, 85 dB at 10 cm. Everything the 1700 (above has) with a flashing light for hearing impaired that allows a visual reminder.